Blythswood marks the western edge of the city’s central business district. The deep cut of the M8 creates a divide between the city centre and its adjacent west-end neighbourhood. The District has a large element of business and commercial use. There is little in terms of pedestrian realm and the modern buildings tend to be high rise with little or no ground floor activation – again nothing which makes the pavement a place for people. The M8 dominates this area, as a major approach to the city centre. It presents a major challenge to people trying to approach the city from the west on foot. 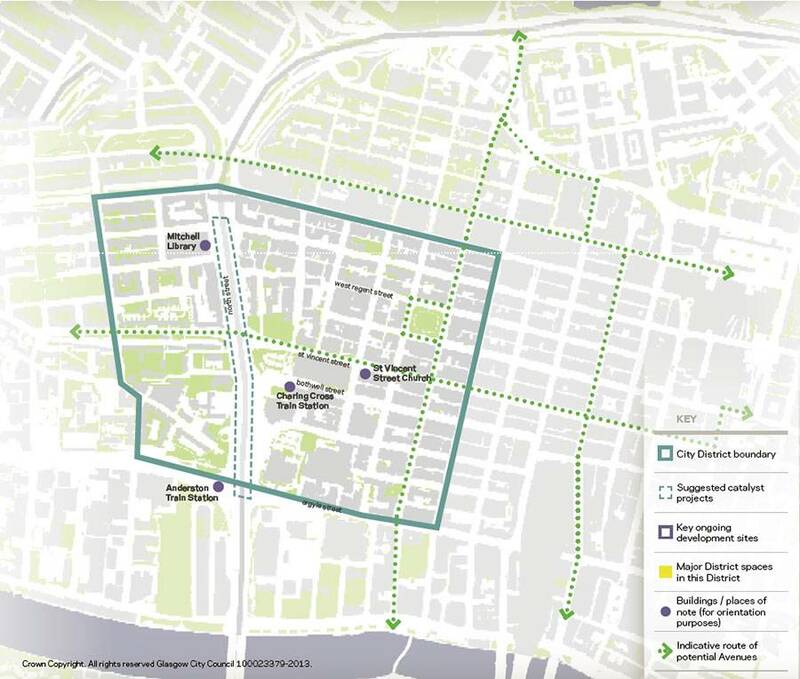 The gap sites and the St Vincent Street overpass, which can be reconfigured to create a strong pedestrian and cycle link directly to the city centre, are great opportunities to re-connect the city. The following Avenues project for this District will significantly improve the look and feel of this public space. A project to complement the Avenues by significantly improving the pedestrian and cycling experience as well as wayfinding. Find out the latest news about Blythswood here.